Scosche SABW525 brackets will allow you to install select 5-1/4" or 6-1/2" speakers in the factory speaker openings of select 1999-06 BMW 3-Series vehicles. Please enter your vehicle information or call an Advisor at 1-888-955-6000 to confirm that these adapters are compatible with your vehicle. Warranty: 60 days. Important Note: Some 6-1/2" speakers use a larger frame and require a larger cutout. We call these 6-3/4" speakers, and they won't fit in this bracket. This bracket will only work with speakers that require a cutout diameter of 5-1/8" or less. will it work in the rear deck area? care to elaborate a bit? speaker size/type? what didn't work? 5-1/4 Speakers: While a 5-1/4 speaker will mount easily in this bracket given the bolt pattern, the frame of many 5-1/4s is smaller than the opening in the bracket, possibly making a 6-1/2 a better fit. 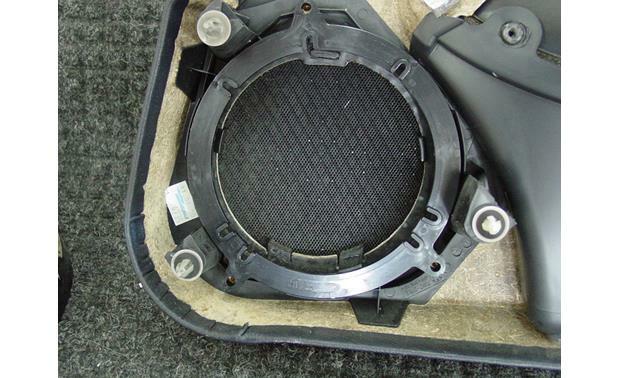 When using a 5-1/4, a speaker baffle will likely be needed to seal the rear of the speaker. will this bracket work with my 6.5 rockford fosgate speakers? Yes. That is where I used them, on my 2000 323ci Coupe. They worked fine. They did in my 2000 328i. mounted JL Audio C6-350 Evolutions. Fit nicely. Does it come with a single bracket or two per purchase? Comes as a pair, and they fit my 2000 323ci like a glove. It does come with two, however don't waste your money. They did not fit my 2000 328I, I had some made fro sheet metal. Good luck! Searches related to the Scosche SABW525 Speaker Mounting Brackets Install 5-1/4" or 6-1/2" speakers in select 1999-06 BMW 3-Series models.